Crytek dropped a pretty big hint that the Crysis 2 demo will make its way to the PlayStation 3, saying that PS3 owners "can probably hope for one" at some point in the future. Xbox 360 owners already have a Crysis 2 demo and PC gamers are getting one in March, but what about the PlayStation 3 crowd? Crytek has been oddly silent about Sony's platform amidst the minor kerfuffle over the originally-platform-specific demo, but Crysis 2 Executive Producer Nathan Camarillo hinted yesterday that it hasn't been forgotten. PlayStation gamers "can probably hope for one," he told PlayStation Universe. "We want as many people to play Crysis 2 as possible. I can't say anything too specific... we haven't announced [the demo] yet." Hope may not be much to go on, especially with the release of the full game little more than a month away, but he also offered assurances (or warnings, depending on your perspective) that the Xbox 360 and PlayStation 3 versions of the game would be virtually identical. "People can try to find [disparities], but they won't find anything," Camarillo said. "They both run great, they both play great whether you're playing single-player or multiplayer - they're identical offerings. The quality is outstanding on both of them; there's really no difference." 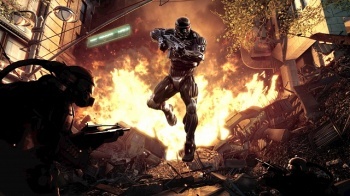 Crysis 2 comes out on March 22 for the Xbox 360, PlayStation 3 and PC.